"There's been a much bigger push to bring in white females, black females — anyone other than a white male." This graduation season, the podium is all hers. For the first time in at least two decades, the majority of the nation's top colleges are featuring women as their spring commencement speakers, a shift that industry experts credit to the wave of female empowerment that has fueled the #MeToo movement. 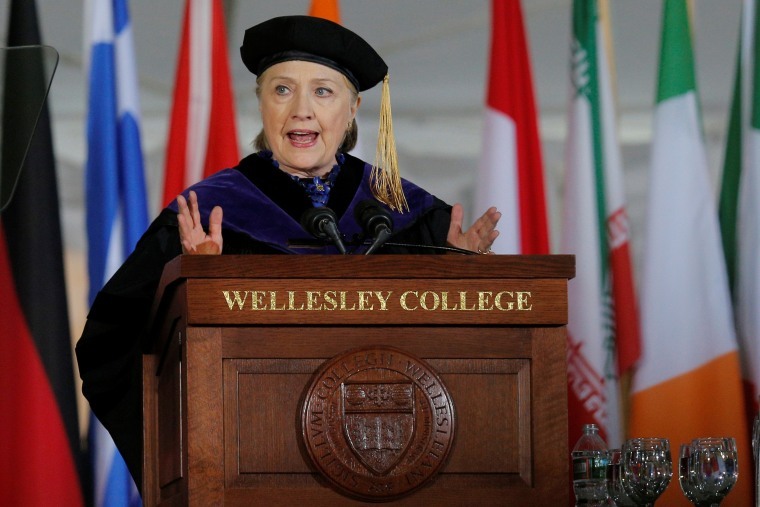 Yale is bringing Hillary Clinton. MIT will host Sheryl Sandberg. Vanderbilt landed Amal Clooney, while Dartmouth chose Mindy Kaling. Overall, women account for nearly 60 percent of the speakers at the 25 schools that have the largest endowments and traditionally carry the clout to draw big names to the lectern. By contrast, women made up just a quarter of the speakers at those schools over the previous 19 years, according to an Associated Press analysis of university records. Companies that are hired to find speakers say they've seen a surge in requests for women at the same time that the #MeToo movement has shed light on sexual misconduct from Hollywood to Capitol Hill. Demand has grown so quickly that some say they're struggling to keep up. "There's been a much bigger push to bring in white females, black females — anyone other than a white male," said Richard Schelp, owner of Executive Speakers Bureau in Memphis, Tennessee, where 40 percent of recent booking requests from schools and other clients have been for women. "We're digging deep into our reservoir of resources." politicsWith Eric Schneiderman out as New York attorney general, who will lead the Trump resistance? Schools contacted by the AP said the #MeToo movement didn't directly influence their decisions, but some said it might have been on the minds of students who help pick finalists. Many start looking for speakers more than a year in advance, competing for prominent figures that will impress alumni and prospective students. Speakers chosen this year include women from politics, business, athletics and the arts, and many reflect diversity beyond their gender. Film director Ava DuVernay will be the first woman of color to give Cornell's speech in a decade. Raquel Bono, a vice admiral in the U.S. Navy and a Filipina American, will speak at the University of Texas, Austin. As ceremonies unfold in coming weeks, experts say graduates can expect to hear speeches on equality, inclusivity and other topics that might have been seen as too thorny in the past. "Because there's so much demand out there, I think they're much more comfortable talking about this," said Don Epstein, CEO of the Greater Talent Network, a New York agency owned by United Talent Agency. "The public is finally saying enough, we want to hear about it." Outside the richest schools, many of this year's marquee speakers are also women. Queen Latifah is headed to Rutgers University's Newark campus. Wesleyan University in Connecticut will hear from Anita Hill, who has become a #MeToo icon for her 1991 testimony accusing then-Supreme Court nominee Clarence Thomas of sexual harassment. It's a stark contrast with past years that saw few female speakers. In 2007, for example, only two of the 25 richest schools chose women. In 2003, none of the eight Ivy League schools did. Colleges say they strive for diversity but face tough competition for a small pool of speakers. And while more women have joined the speaking industry in recent years, experts say they remain widely outnumbered by men. Bringing celebrity speakers can also carry a hefty cost — sometimes upward of $100,000 — leading many schools to seek alumni or others who won't charge a fee. Still, some schools have brought far fewer women than their peers. A handful of colleges have brought just three in the past two decades, including Harvard University and the universities of Notre Dame, Michigan and Pennsylvania. Notre Dame officials said they look for a mix of speakers but are sometimes thwarted by scheduling conflicts. Still, they showcase diversity in other ways, spokesman Dennis Brown said. Class valedictorians, who also speak at graduation, have been women five of the past 10 years, he said. "Our graduates do hear from a variety of voices, including women and people of color," he said. Sheryl Sandberg speaking at UC Berkeley's commencement address on May 14, 2016. In cases where schools don't have speakers at their university-wide graduation ceremonies, the AP analysis counted less formal class day or senior day speeches that are typically organized by students. Yale, which has brought five women to its class day over the past 20 years, said administrators usually play only a small role. A few colleges have brought a rough balance of men and women in recent decades. At Dartmouth College and Duke University, women account for 40 percent of spring speakers since 1999. Dartmouth officials attribute it to a wide pool of successful female graduates, along with some scheduling luck. At Vanderbilt, which has been bringing speakers for 15 years, 60 percent have been women. Provost Susan Wente credits the committee of students that helps pick finalists. "That student advisory group is diverse amongst itself," she said. "They have consistently produced a slate of finalists that are also diverse." Epstein, whose company worked with about 30 college commencements this year, said demand for women has been growing over the last year — and is still mounting as schools begin planning for next year. "I think we're just scratching the surface here," he said. "This is not a flash in the pan. This is a long-term issue that's going to be around for a long time, until there's real equality."